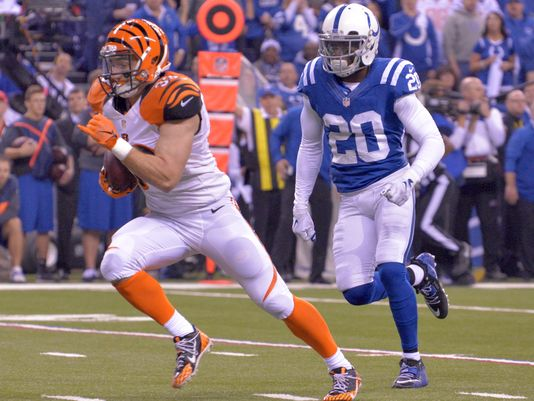 The Bengals unveiled the surprise of running back Rex Burkhead playing receiver in the playoff loss at Indianapolis. His time there came by virtue of significant attrition at the position, but during Tuesday's organized training activity session, he returned to the spot where he caught three passes for 34 yards. Burkhead worked with receivers and even caught a slick route over the middle for a long gain during the only practice open to the media during this week of OTAs. Hue Jackson approached Burkhead last year with the idea of slipping over to receiver and sounded determined to find ways to get the 2013 sixth-round pick on the field despite sitting behind Jeremy Hill and Giovani Bernard on the depth chart. "He's very talented," Jackson said. "You have a talented player on your team you see if you can find a way to get him involved. He can do a little bit of everything. He can run the ball, too. He can catch, protect. He's one of the better players on our team so we will see what we can do with him." Burkhead said he's spending about half of his time now with the receivers and half with the running backs. The actual act of receiving the ball comes as the easiest aspect of his transition. The challenge comes with retention of route concepts and different attacking styles when lined up in the slot. "When you're coming out of the backfield you're usually going against a linebacker and you're usually going against straight-up man. Or it's a simple zone you can read off of," Burkhead said. "Now you've got cover-2, quarters, cloud coverages, and other things you have to learn about. And you're running against nickel, dimes with corners and safeties. So it's new, especially when I'm running some routes I've never run before." He caught 60 passes for 507 yards and five touchdowns during his four seasons at Nebraska. Whether running back, receiver or anywhere on the field, Burkhead could care less how he ends up involved. "Any time you can find a way to get the ball in your hands, you're more than happy to do that," he said. "So yeah, I'm looking for those ways, and hopefully coaches have the confidence in me to get the ball in my hands."